Use this simple and professional mockup to showcase your newest designs to all your customers and captivate an ever growing larger audience! This mockup shot in a photographic studio is the perfect addition to your marketing campaign. Check out this new drawstring backpack mockup now. 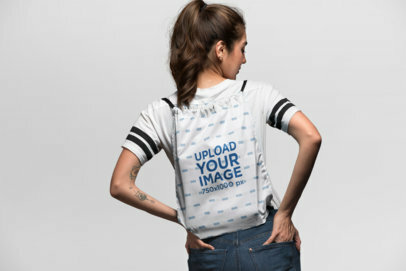 Create a gorgeous visual featuring a woman carrying a drawstring bag on her back and promote your designs using an awesome image that your customers will love. 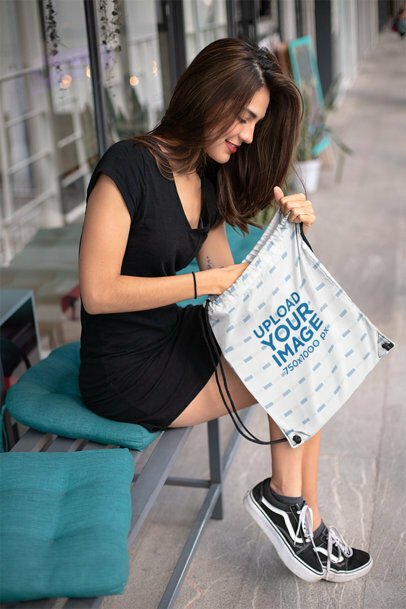 Start now using Placeit and create an awesome mockup to showcase your design for a drawstring bag with a super cool visual and watch your sales grow! 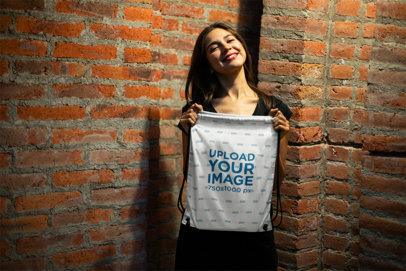 Customize this amazing drawstring bag mockup featuring a gorgeous girl having a good time to showcase your latest drawstring bag design. Give your audience a professional image they can easily relate to using this or any of our mockups! 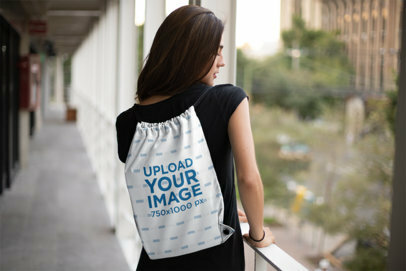 Use this promotional drawstring bag mockup now and appeal to your clients as never before! 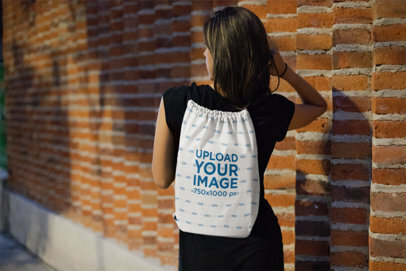 Create an image to promote your drawstring bag design with Placeit! This cool visual is an excellent choice if you want to showcase your design worn by a student. 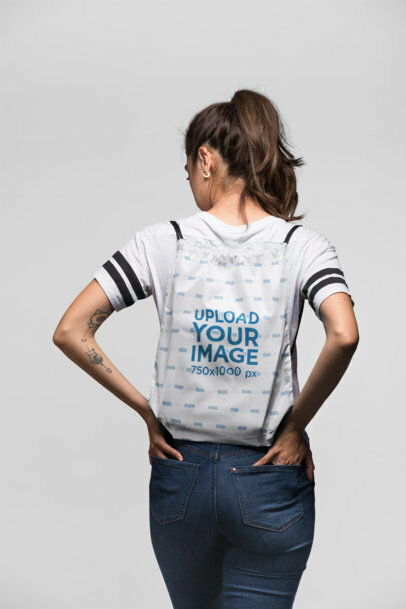 Use it now and start making your customers see how cool your latest drawstring bag design really is. Make your revenue grow using drawstring bag mockups by Placeit! 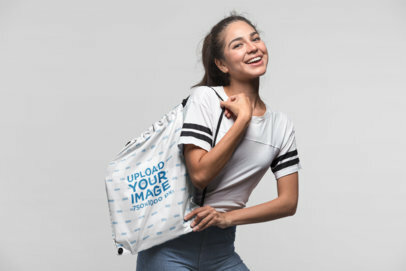 Create a cool visual to promote your latest designs in bags for students with Placeit and make your revenue grow by showing an awesome visual that your that your audience will really appreciate. Using a visual as this is a great choice since your audience will see a more realistic version of your design! Looking for a way to promote your cool drawstring bag designs? Use Placeit! This amazing visual is a great choice because it will let you show a realistic version to your audience of your drawstring bag design. 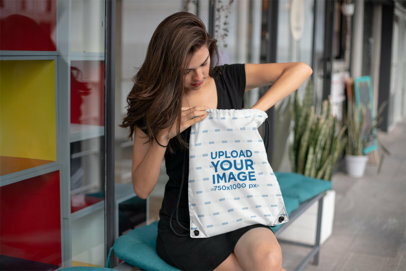 Start now and make your sales grow by showing people a photorealistic visual featuring your drawstring bag! Look no further, you've come to the right place. Looking for a way to showcase your newest drawstring bag creations to your customers? Placeit's got the right digital product for you! Customize this beautiful mockup and start growing your audience now! Did you make a cool design for drawstring bags? Start promoting your awesome designs with Placeit's mockups. Our mockups are made to be functional, easy to use, and trendy. Like this one featuring a cool girl showing her drawstring bag. Your design will be front and center. Try it out now. 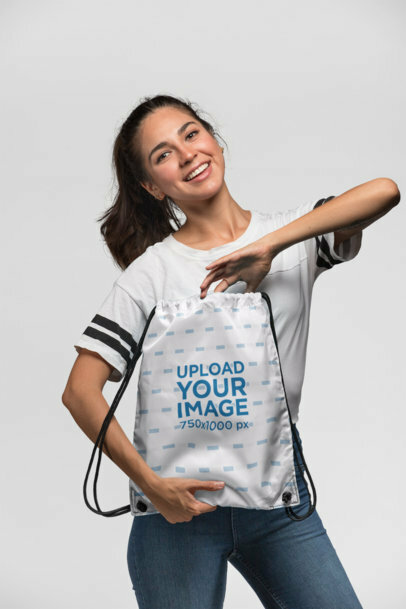 Create an awesome image to promote your drawstring bag design using this mockup from Placeit of a happy woman at a studio! It's a gorgeous image that you should use if you are looking to make your revenue grow using a visual that your audience will love. 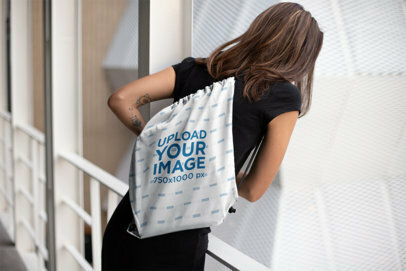 Start now using Placeit's mockups and show your drawstring bag with a cool visual! This cool mockup of a girl looking over a guarding rail is an excellent choice if you are looking to promote your latest drawstring bag design using a visual that your customers will love. Start now and show your design using a realistic visual so that your audience will understand what your products will really look like in real life.